first posted on cold air currents. 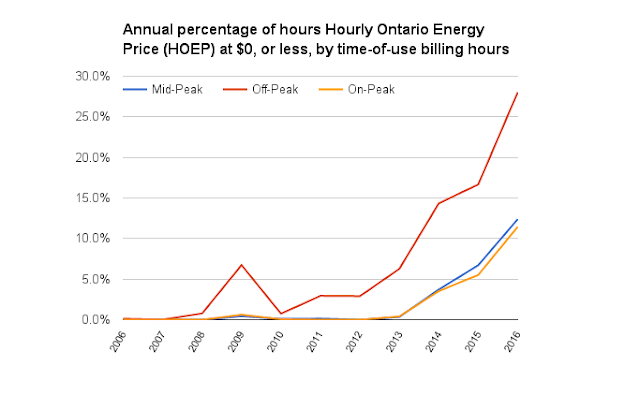 Since I posted Reliable Electricity Generation Capacity declining in Ontario the IESO's NPCC 2016 Ontario Interim Review Of Resource Adequacy was published. The report concludes Ontario's system can meet Loss of Load Expectation (LOLE) criteria for the 2017 to 2020 planning period once Emergency Operating Procedures (EOP) are assumed. EOPs are indicated to be essentially 1/3rd public appeals to reduce consumption, and 2/3rds voltage reductions. I wrote "With the exception of 2013 the capability at peak has declined every year since 2010, despite IESO-connected generator capacity being greater now than it was six and a half years ago," so I thought it only fair I offer a brief analysis of how the IESO is meeting the reporting requirements for resource adequacy - and the repercussions of how they are doing so. The first thing the IESO has done is knocked down "high demand growth" potential - for 2017-2019 about 3 times more than they knocked down the "median Demand Growth" scenario. 2016's review, from this IESO document approved December 6th, 2016, has resources for summer peak at 28,177 megawatts (MW), which is 2,510 MW - or 10% - higher than the "Forecast Capability at Outlook Peak" the same IESO reported in its December 15th 18-Month Outlook. Regarding the second point, the resource assessment indicates its much higher number could be due to calculating 100% availability from thermal units (after "discounting for seasonal derating") and "Projected effective capacity of the following demand-side resources: Peaksaver, Demand Response (DR)/ Capacity-Based Demand Response (CBDR) and Dispatchable Loads." This approach may have merit, of course, but the resource assessment's 2017 normal weather, median demand growth, peak is only 168 MW greater than the 18-month forecast's normal weather peak for Summer 2017. Effectively the IESO's resource assessment provides demand figures after demand-side resources are applied while also counting on those resources to meet demand. The increase in the IESO's expected "available resources" is due, entirely, to the extension of pre-refurbishment lives of nuclear units at Bruce Power. A nuclear refurbishment outage that was previously expected to take place commencing in 2017 has been deferred, leading to increased resource availability in 2017, 2018 and 2019. Revisiting Ontario's 2013 Long-Term Energy Plan (Figure 14) indicates the deferred refurbishment outages are at Bruce A units 3 and 4 - both beneficiaries of the operator's maintenance program's innovative shifting of fuel channels. Note the increases in 2017 and 2018 are less than the total benefit of extending Bruce Unit 3, so aside from nuclear capacity expectations shrunk in the latest resource adequacy assessment. I've designed this graphic to show the number of hours by time-of-use period because surplus supply situations are often described as overnight occurrences, but this is not longer true. 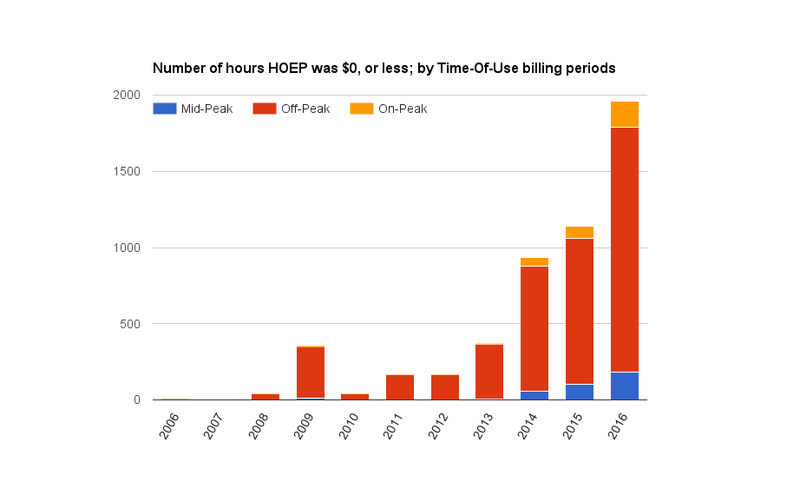 Another view of the same data, this time showing the percentage of hours the HOEP fails to rise above $0, demonstrates the rapid rise in daytime (On-Peak and Mid-Peak) electricity giveaways. What the IESO forecasts, and reliability reporting, is indicating is the nuclear industry is vital to resource adequacy in the province. This would be a better thing if the IESO and its political masters understood what resources will never be vital to our resource adequacy. The reality of needing nuclear's full capacity in the coming years should spur programs to utilize all generated power - much of which is now dumped on export markets or curtailed altogether. If the IESO, and their political masters, understood this, and wished to be useful, it's unlikely they'd be dropping their "High Demand Growth Forecasts" concurrent with their own market's price collapsing and rising interventions, by them, to curtail committed generation.